Qiu Zhijie poses at the opening of the Chinese pavilion presenting ‘Continuum-Generation by Generation’ during the 57th International Art Exhibition of La Biennale di Venezia in Venice, Italy, May 10, 2017. This piece was first published on the NYR Daily on January 6, 2018. One of China’s most influential artists is forty-eight-year-old Qiu Zhijie. A native of southern China’s Fujian province, Qiu studied art in the eastern city of Hangzhou before moving to Beijing in 1994 to pursue a career as a contemporary artist. At the time, contemporary art was illegal in China and artists often lived in villages on the outskirts of town, held underground exhibitions, and were patronized almost exclusively by foreigners. Qiu quickly made a name for himself as one of China’s leading artists, creating one of the most famous images of that era: a picture of himself from the waist up, shirtless, against a white wall with an enormous red character, 不, or “No,” painting across his face and torso. Another was a video of him copying a classic piece of calligraphy, the fourth-century Preface to the Poems Collected from the Orchid Pavilion, one thousand times until it became illegible. More recently, he has embarked on major conceptual art projects, such as an exploration of the suicides that take place at a major bridge that for decades was a symbol of Communist self-reliance, and dozens of enormous idea maps that juxtapose mythology, politics, and social critique. I got to know Qiu in 1999 when I wrote about the controversy surrounding an influential exhibition called “Post-Sense, Sensibility, Alien Bodies & Delusion.” Held in the basement of an apartment block, it was a backlash against the political pop art of that era, purposefully creating art that couldn’t be sold or collected: a human cadaver encased in a block of ice, for instance, or dead animals nailed to the wall. Disgusted, the authorities closed the show the day it opened—a response reminiscent of the one that greeted the Guggenheim’s current major retrospective of Chinese art, with the museum removing live animals from several exhibits. Qiu’s work features prominently in the Guggenheim show. He was the only artist commissioned to make an original work, one of his idea maps; his Orchid Pavilion calligraphy is also on display. Unlike prototypical dissident-artists such as Ai Weiwei, who have shunned China’s art establishment and work mainly abroad, Qiu is now firmly part of the Chinese art establishment. 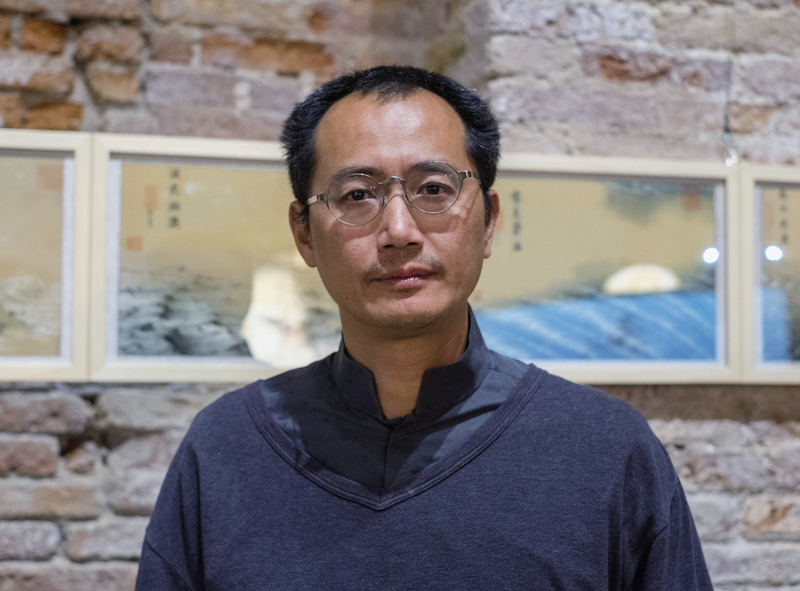 He teaches at the Central Academy of Fine Arts, the most influential art school in China, as head of the Department of Experimental Art, and curated the Chinese pavilion at last year’s Venice Biennale. Last month, I met Qiu at his studio in the eastern suburbs of Beijing, where we talked about the challenges of maintaining artistic integrity inside the system, censorship, how he lectures on Communist Party ideology, and the Party’s transformation to a Party of nationalism. Ian Johnson: What do you think of the new Guggenheim show? Qiu Zhijie: I think it’s somewhat too late. It should have been 10 years ago. Their [the curators’] goal was to catch the 1990s. They wanted to change the image of Chinese painting away from political pop and the “big-face school” [painters such as Fang Lijun, who became internationally famous for making paintings of round, bald-headed people, often looking bored]. This is a great idea but the dates are off. The cutoff for the show was supposed to be 2008, but most of the art is from the 1990s. For some of the artists, you’re seeing their first piece of work, but many have done much better work since then. Qiu Zhijie: Map of ‘Art and China after 1989: Theater of the World,’ 2017. Ink on paper, mounted to silk, six panels, 240 x 720cm overall. But weren’t the 1990s very important to Chinese art? Yes, but I think the most important year was 2001, when Beijing won the Olympic bid. That’s why I made it so big on my map in the show. But the curators thought that other things were more important, like post-1989, or Tiananmen, or Beijing holding the Olympics in 2008; I guess that’s why it ended in 2008. But it wasn’t holding the Olympics [that mattered]; it was winning the bid. Because holding the Olympics was just the routine work of carrying out something. But winning it, in 2001, was important. That was when Chinese contemporary art went from being underground to something accepted by the government. At the same time, China joined the World Trade Organization. And September 11 happened. So, to me, 2001 was the most important year—more so than 1989. They knew they were holding the Olympics and so they needed to tell the world that China is open and peaceful, and we needed contemporary art as a business card to show the world how open we were [italics indicate English in the original]. That year, Li Lanqing went to the Berlin Hamburger Bahnhof art show. In 2002, the ministry of culture sent us to attend the Sao Paolo Bienal. And in 2003, they had the first Chinese pavilion at the Venice Biennale. It all happened so fast. And now you’re an instructor in the country’s leading art school. What’s that like? Have you read the three-hour work report that he delivered at the Party Congress in October? I saw it. It was remarkable. But more remarkable was that [the 91-year-old former Party Secretary] Jiang [Zemin] could sit there for three hours without drinking water, without going to the bathroom. When he got up to leave, someone wanted to help him but he didn’t want the help. He wanted to walk himself! What about things you can’t teach? Reports have circulated that Chinese universities should suppress foreign ideas. What about sensitive topics like the Tiananmen Massacre on June 4, 1989? We discuss June 4. Because if you don’t discuss it, they’ll use VPNs and go see it themselves anyway. That’s how I see it, anyway. Where were you on that day back in 1989? I was in Hangzhou. I was one of the students’ leaders. I was 19 years old, a freshman. I was at the Zhejiang Fine Arts Academy. Back then, people said we were used by the Voice of America and foreign media. We didn’t feel like that. We felt we were patriotic. We don’t talk about June 4 too much. But if there’s a question I answer it. I think June 4 is the biggest taboo area, the most sensitive, the only thing you’re really not supposed to discuss. What about the Cultural Revolution? Absolutely, yes [it can be discussed]. In class, I discuss trends of socialist thinking. We discuss things like Maoist leftists like [deposed leader] Bo Xilai. You can talk about that. Things like Taiwanese independence or Hong Kong independence, these aren’t problems. Are there limits to being tizhinei—inside the system? Of course, there are limits being tizhinei but there are things you can accomplish. Like our current plan to bring together artists, entrepreneurs, and scientists for long-term cooperation. If you’re an independent artist, you won’t really be able to accomplish this. But if you’re with Central Academy of Fine Arts then you can form a team with the Chinese Academy of Sciences. But there’s a price. The price isn’t that you’re limited [in what you can do], but “bureaucratism.” It consumes your time, delays you, with so many of these meetings that I loathe. For example, for our project on entrepreneurs and scientists, we held a big meeting. I wanted to put up some ads in the subway to bring in the public—it’s a great topic and the room could have been full. But this is against some rules of how you can spend public money. There are all these strange rules. Some people describe artists inside the system as being zhao an [a term from ancient China that refers to a feudal lord offering rebels an amnesty and a chance to join his army]. Yes, they say that of us. In order not to be accused of this, in an interview you have to curse the Party. Should I curse the Communist Party? Then I guess I would become as famous as Ai Weiwei and win prizes abroad. I’d move to New York with my wife and children. But what about young people? They’ll just continue to learn oil painting or sketching from plaster figures [old-fashioned styles that Qiu has supplanted in his classes with more contemporary methods]. If you really want to change China, you have to give young people a chance to see new things. From one’s own advantage, it’s okay. I can give an interview to The New York Review of Books or CNN [laughing] and curse the Party. Sure, why not? So I think this term zhaoan, it’s not fair. They’re just telling an old story, that Mao was a terrible old dictator and here’s a fighter for democracy. But things aren’t really like that. This government has deep ties to Wall Street. It’s not a traditional dictatorship. It’s a new type. It’s now much more complicated. All these things are mixed in together. The map you made for the Guggenheim shows all sorts of ideas and strands of China moving along a giant river. Some of the ideas are sensitive, like the Great Leap Forward, Mao, and the Cultural Revolution, leftists like Bo Xilai and even Ai Weiwei. Can you show a piece like this inside China? Yes, I’m planning a show of it and others in China in 2018. I have things that are more political than that. It shows all these strands in China: public intellectuals, Confucians, Daoists, Buddhists, the Party, democracy, the Cultural Revolution, the Long March, Maoist thought. . . They’re all moving toward this Roman-style Coliseum. And they are all fighting in the Coliseum. I plan to show this, too. But you don’t know where the line is. It doesn’t matter if it’s shown in Paris or New York, the state security watches it. They know what I’m painting. Do you think it’s because contemporary art doesn’t influence ordinary people? So they don’t care—if a few people watch it, it doesn’t matter. I think they do want to control it. The thing is, the government doesn’t have a unified will. Maybe Xi would see this and think, “Who cares,” but the Public Security Bureau looks at it and thinks, “No.” Or Xi would see it and get angry. You don’t know. You really don’t feel that things are harsher or tighter now? It’s like this: because the anti-corruption crackdown was so harsh, officials don’t dare act or do anything. Everyone speaks in formulaic language, and reads the Party’s documents. That kind of atmosphere isn’t good. Actual measures are few, but you do feel a kind of authoritarianism that’s worse than before. For example, say a leader is coming to visit, then everyone is nervous for a few days. And if this big leader wants to eat a meal, then everyone is running around, checking security, figuring out what will he want to eat, and so on. In the past, it wasn’t so nervous. You can feel a nervousness. Wasn’t it more relaxed, say, 10 years ago? In terms of exhibitions, I feel it was about the same as now. Ten years ago, I took some students to Tibet to do a survey. We called the resulting show “Why Go to Tibet?” It was about why so many Han Chinese were traveling to Tibet and painting Tibetan people. So, back then, someone came by and said not to use the title. So I changed it to “Why Go There?” and that was it. It’s not like after the big meeting on culture [in 2014] or the 19th Party Congress that the thought control has tightened. But I do think that the overall atmosphere of being afraid to make a mistake, that’s very pronounced. It seems like the government views contemporary art as a resource to help foster creativity—hence these projects to bring together scientists, entrepreneurs, and artists. Isn’t this instrumentalizing art? Well, it’s better than the police coming and closing down your exhibition. But it is part of the country’s plans for China’s future. In a way, it’s remarkable when you think of how contemporary art is viewed by politicians in other countries. The Party’s goal is China’s future. So the 19th Party Congress document talked about the happiness of Chinese people. Or the revival of the people. It didn’t say anything about realizing Communism. So it’s become a kind of party of nationalism that happens still to be called the Communist Party of China. It’s even embraced traditional culture. What do you think about that? You practice calligraphy, but you’re also an advocate of contemporary art. The problem is what we mean by tradition. How do you explain tradition? Qin Shihuangdi [the brutal first emperor of China] is part of Chinese tradition. So is [the Daoist philosopher] Zhuangzi. It will take a lot of effort to figure this out. What are we trying to promote? This is what China still doesn’t know. This interview, part of Ian Johnson’s continuing NYR Daily series, “Talking About China,” was supported by a grant from the Pulitzer Center on Crisis Reporting.